23 Jan I want to lose weight, but how do I start? When there is overweight, our health is deteriorated, it is no longer just a visual issue. Therefore, losing weight means reducing the risk of suffering or developing diseases and reducing ailments and symptoms. In case of suffering Osteoarthritis, the improvement in the quality of life is well known. First you have to be convinced of wanting to lose weight. To do this, write a list of all the things that would improve in your life and you would be able to do by losing weight (try to get at least 15). Put that note somewhere visible and read it every day. Well, once you have your motivations clear, the next you should be aware that this would be a long distance race, do not pretend to have the results you want next month. Instead of focusing on the result, focus on each day, because every day you will have to behave better, and every day you will do something that is beneficial for you. This means that you do not have to follow a perfect diet, but take better decisions every day. Eat more times a day, but less quantity. Use smaller plates if necessary. If you are very hungry at a meal, take soup or salad first. This will satisfy you more. Always carry something with you: nuts, almonds or fruit. That way you can eat something when you are out. Avoid desserts, even if it is fruit or yogurt. Leave it for the snack time. We are going to change the pantry. This is the most important point that will make you lose weight without realizing it. The objective is to change all the products that you have for others of better quality: less processed, without sugar and wholefood. For this, you should start reading the labels of the products. You will always see that there is a list of ingredients and a composition table. Most of the people are used to just looking at the calories in the table. Now, during this step, we are going to look only at the list of ingredients meaning what that food is made of. The ingredients come in order according to the percentage used (for example, if sugar is the first ingredient, it means it is present in the largest amount in that product). If you are buying a product of wholemeal flour, such as bread or cookies, in the list of ingredients there should be the indication ”wholemeal flour…”. – Check the food you have in your pantry and refrigerator. Read the labels (list of ingredients) and note if those products contain sugar. Write down those that have added sugar (also called syrup, molasses, dextrin, glucose …). – Write down all the pasta or white rice (refined). These are basically starch ingredients with lots of sugar. – Do you have cans? Prepared food? Frozen? Most are very processed food. When you have the entire list, you are ready to look for substitutions and go shopping. I give you some examples: if in your list there is yogurt with berries (processed), change it for natural yogurt; if you have sausages (highly processed), substitute them for roasted ham or Iberian Serrano ham; if you have white pasta and rice, replace it for wholefood (you’ll feel a bit weird at the beginning , but I assure you that you will notice the difference in your body), and finally, for example, the breakfast flakes can be replaced with muesli without sugar. The list is as long as the food you have in your kitchen. 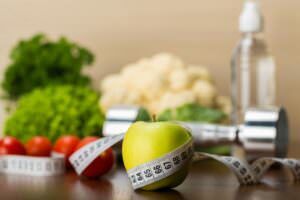 You will see, you will begin to lose weight by applying these guidelines. Importantly do not stress, do it at your own pace and seek help from a professional to guide you. In addition, this process will help you to include anti-inflammatory food, teach you to choose, avoid harmful food for your health and keep your strength strong during your process.